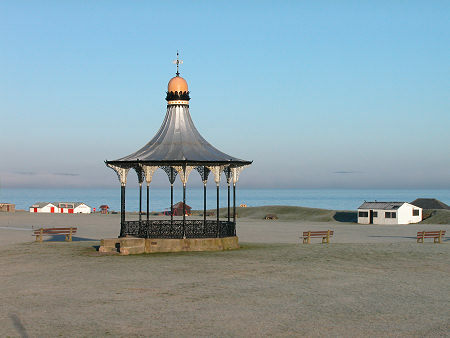 In 1886 Nairn was described by a visitor as "the Brighton of Scotland". Located on the coast of the Moray Firth some 15 miles east of Inverness it enjoys one of the sunniest climates in the country, and by the 1880s its place on the Victorian railway network of northern Scotland had ensured its rapid growth as a seaside resort. You can think of Nairn as three quite different settlements nestling together. 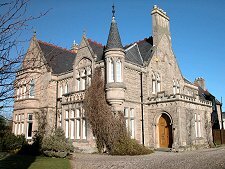 The Victorian resort that started with the arrival of the Inverness and Nairn Railway in 1855 was the last of these distinct settlements and left its mark most strongly in the western part of Nairn. Here grand mansions and villas still line leafy avenues. Many have now been converted to hotels, some with superb sea views. West Nairn is separated from the countryside beyond by the seaside course of the Nairn Golf Club, one of two 18 hole courses in Nairn. Nairn Golf Club was home to the Walker Cup in 1999. 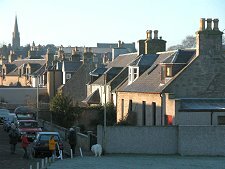 Long before the railway arrived, Nairn had grown up as a market and farming settlement inland of a fishing village probably first settled by the Norse before 1000AD. 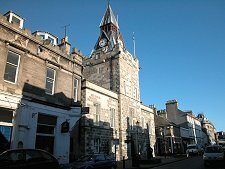 For much of its history Nairn sat a little uneasily astride the boundary between the Gaelic speaking Highlanders engaged in fishing, and the English speaking north-easterners who did the farming. James VI is said to have remarked that here was a town in his kingdom so large that the people at one end of the High Street spoke a different language to those at the other. The main shopping area of today's Nairn lies the heart of the old farming community. 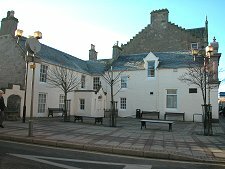 Here, recorded only in the name of a square, you will find the site of Nairn Castle, built in the 1100s and finally demolished in 1585. Here too, you will find a range of interesting shops constructed mainly of an attractive grey stone. The mouth of the River Nairn was probably the site of the original Norse settlement. 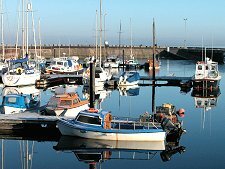 A major spur to development was the building by Thomas Telford of the harbour here in 1820, and by 1850 Nairn was home to 60 fishing boats and 400 fishermen and their families. Today, there are far fewer fishing boats on view though the harbour is the base of the Nairn Sailing Club. The area to the south of the harbour houses the many small cottages of Fishertown. To the west of the river is the attractive promenade area and beach, while another beach and nature reserve runs east from the mouth of the River Nairn, its dunes separating the Nairn Dunbar Golf Club from the sea. 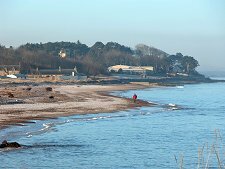 The area beyond the River Nairn becomes increasingly remote with dunes and mud flats backed by the Culbin Forest extending for over ten miles to the north east to the mouth of the River Findhorn, opposite Findhorn itself.